At the fundamental level, the heart is a pump. Blood is pumped from the heart to the lungs to get oxygen, sent back to the heart, and then sent everywhere else in the body. Unfortunately, the heart is not invulnerable. It can be subject to numerous forms of distress that impede its ability to function properly and put someone’s life at risk. “Heart attack,” “cardiac arrest,” and “heart failure” are terms that are sometimes used interchangeably, especially in television and movies. Medically, however, the three are very specific terms that refer to different conditions. And one of them, heart failure, is the leading cause of hospitalizations for people over the age of 65. Before heart failure can be properly explained, however, a bit of clarification is in order. • A heart attack is when something is physically obstructing the blood flow to the heart. If the blockage is not removed quickly, portions of the heart will begin to die. This can be analogized as a “plumbing problem.” It is not always fatal, but can cause long-term damage if not resolved quickly. • Lastly, congestive heart failure is when the heart is able to pump blood, but is doing so weakly. This can be compared to a “mechanical problem.” Despite the rather sudden-sounding name, this is actually a chronic condition. What Happens During Congestive Heart Failure? The heart has four chambers: the atria (the upper two chambers of the heart) and two ventricles in the lower half. The atria receive blood and the ventricles send it back out. In congestive heart failure (CHF), the ventricles are unable to pump a sufficient volume of blood. Congestive heart failure has two subtypes: left-sided and right-sided, depending on which of the ventricles is pumping improperly. The two can occur in tandem or on their own. Left-sided CHF is more common. In both forms of CHF, blood will build up in the blood vessels and result in fluid retention. The location this happens in depends on which ventricle is affected, as they send blood to different areas. Many of the symptoms of congestive heart failure are the same across both types. Initial symptoms—mainly fatigue from reduced blood flow and fluid retention—causes an increased need to urinate (polyuria). that tends to happen especially at night. The retained fluid may also cause weight gain. Since the body’s need for oxygen and nutrients increases during physical activity, an inability to tolerate exercise or other forms of exertion can appear as well. In right-sided CHF, the blood supply to the lower extremities is affected. The fluid retention results in swelling in the ankles, feet, and legs. The swelling will be most noticeable after a period of sitting. In right-sided CHF, pitting edema can develop. This is when pressing down on the skin in the swollen areas leaves a mark that stays visible for a few minutes before fading. As heart failure progresses, a noticeably irregular heartbeat (palpitations) can be felt and a racing pulse can occur. At the most severe stages, patients can develop radiating chest pain, rapid breathing, blue-tinged skin from lack of oxygen, and fainting spells. CHF requires that something either damages or weakens the ventricles, so it can result from a few different cardiovascular conditions, among other factors. • Cardiomyopathy: This is a catch-all term for any damage to the heart that is not caused by blood flow or arterial problems. It is a progressive condition where the heart is abnormally enlarged, stiff, or thickened. This compromises the ability to pump blood and can lead to congestive heart failure. Cardiomyopathy can be caused by certain infections, alcoholism, or drug use. • Heart attack: As mentioned initially, a heart attack is when an obstruction causes part of the heart to begin to die. If not treated quickly enough, long-term damage—such as a weakened ventricle—can occur. • Valve conditions: The heart valves open and close to regulate the amount of blood that passes through the heart. Damage, disease, or genetic conditions can result in valves that do not function correctly. This can strain the ventricles and impair their pumping ability. • High blood pressure: Increased blood pressure, regardless of the cause, can result in thickening of parts of the heart muscle. This is specifically called left ventricular hypertrophy. A diagnosis is made by a combination of blood tests, stress tests, chest x-rays, heart ultrasound, and angiograph. The available treatments largely depend on the exact cause of the CHF. Speaking generally, the three main goals of any CHF treatment are to correct the cause, ease symptoms, and prevent symptoms from worsening. • Surgery or catheterization can be used to repair damage to certain parts of the heart muscle or to relieve blockages. 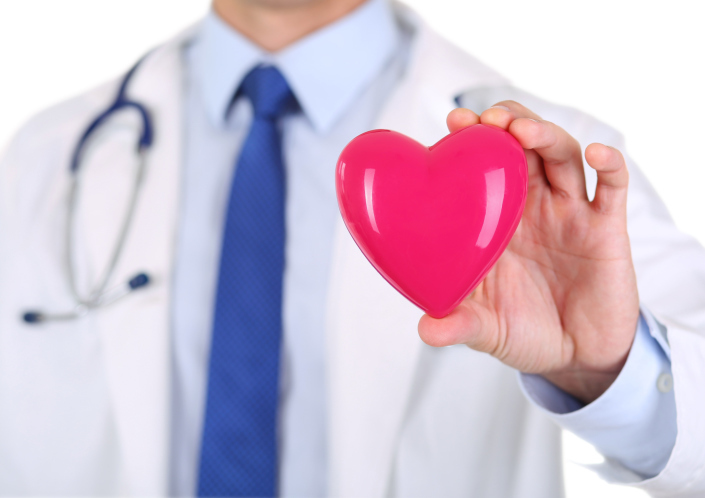 In extreme cases, a heart transplant or valve replacement operation can be performed. • Lifestyle changes can be made to avoid aggravating factors, like alcohol or high blood pressure. Special diets are sometimes devised as well. • Excess fluid can be drained or diuretics can be used to increase the amount released through urination. • Medications are used to either help resolve the underlying condition or to better manage the CHF symptoms. Certain inhibitors can open up narrowed blood vessels, while beta-blockers are used to reduce blood pressure and ease a rapid heart rate. • Pacemakers can be used to help manage the heart rate and keep it from becoming too uncoordinated. • CHF puts the patient at an increased risk of developing an abnormal heart rhythm and going into cardiac arrest. To help manage this, sometimes an implantable cardioverter defibrillator (ICD) is implanted. As the name might suggest, this is a sort of internal defibrillator that is installed as part of a pacemaker and will detect and apply shocks to life-threatening arrhythmias. Only certain forms of CHF with underlying cardiac causes qualify for an ICD. The overall prognosis depends on a mixture of how early the CHF is detected, the underlying cause, how well the patient sticks to the treatment, and if they have any accompanying conditions like diabetes. As a gradual condition, congestive heart failure is defined by a series of stages depending on how far the symptoms have progressed. The stage of CHF that a patient is in is both an off-hand indicator of the severity of their condition, as well as a determinant of what kinds of treatments are available. • Stage one: This is a “pre-stage.” In stage one, the patient has not developed any of the ventricular symptoms of CHF and shows no physical or activity limitations, but instead shows several high risk signs. These indicators can include high blood pressure, family history of cardiomyopathy, diabetes, coronary artery disease, a personal history of alcohol abuse, or having taken drugs known to damage the heart. The treatments at this stage are mostly lifestyle changes, such as quitting smoking, exercising regularly, and avoiding alcohol. Medications offered at this point are ones used to treat underlying cardiac or blood pressure issues, if any. • Stage two: This is when a ventricular dysfunction has been diagnosed, but before the main physical symptoms develop. There is a slight limitation in physical ability and symptoms will appear on occasion during normal activities. People in this category are often those who have suffered damage from a prior heart attack, a valve disease, or cardiomyopathy. The same treatment options from stage one apply here, as well as possible surgery for coronary repair. • Stage three: When symptoms finally appear and a distinct limitation on activities begins, patients are said to be in stage three. Fluids have begun to build up in the body and cause shortness of breath, fatigue, and/or a reduced tolerance for physical exertion. Stage one treatments still apply, but are joined by beta-blockers and ACE inhibitors to help blood flow. Diuretics are also employed to help eliminate the excess fluids. Additional dietary restrictions, like reduced sodium, are introduced as well, along with regular weight monitoring to keep an eye on the fluid build-up. In some patients, a pacemaker may be advised. • Stage four: Stage four requires not only the advanced symptoms to appear, but needs them to have manifested, despite the patient having received optimal medical care. The symptoms are pronounced enough now that they produce extreme limitations and commonly appear when the person is at rest. At this point, although the treatments from all prior stages are still used as much as possible, more dramatic interventions are considered. Heart transplants, pacemakers, additional surgeries, or clinical trials can be considered. In the most advanced cases, palliative or hospice care is offered. While it can be scary if you or a loved one is experiencing CHF, it is a condition that can be lived with. By following the appropriate treatments as prescribed and recommended by your doctor, and with the necessary lifestyle changes, people with CHF can easily live for decades. Online support groups for people with CHF also exist, so no one needs to go through the condition alone. Macon, B. L., “Congestive Heart Failure (CHF),” Healthline web site, July 25, 2012; http://www.healthline.com/health/congestive-heart-failure#Overview1. “Heart Disease and Congestive Heart Failure,” WebMD web site; http://www.webmd.com/heart-disease/guide-heart-failure, last accessed August 24, 2015. O’Brien, T. X., “Congestive Heart Failure,” eMedicineHealth web site; http://www.emedicinehealth.com/congestive_heart_failure/article_em.htm#congestive_heart_failure_overview, last accessed August 24, 2015.